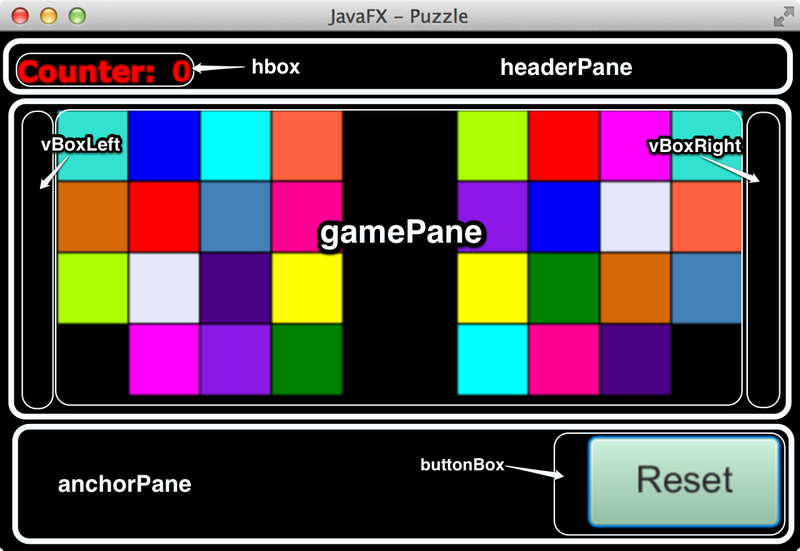 The following article describes how to create a simple Puzzle game with JavaFX. In this example MouseEvents are used to trigger the move of a puzzle tile from one position to the next. The EventHandler is registered on a Rectangle with setOnMouseClicked. The colors of the tiles can be customized via a CSS file. Also a Property Binding is used to update the text value of a Label automatically. The goal of the game is to move the tiles on the left side in the same positions as the tiles on the right side. One field is empty so a mouse click on an adjacent field moves the tile on the empty position. Every move increases a counter. Here you can see an example video of puzzle game. In the next step I created a class which describes the model of the puzzle game. It stores the positions of every tile and has some functions for initialization and shuffeling the board, moving tiles, checking if the boards are equal, switching tiles and a debug output of the boards. This class containers no JavaFX code. If you want a MVC architecture you have to move some of the functions into a controller class and register some listeners so the view reacts on changes in the model. I thought it was to much for this simple example so the model contains some controller functions. * Compare the colors of the rectangles. If you want to change the difficulty to solve the puzzle you can decrease the number of shuffle operations in line 80. (1000). The number behind the counter is realized with a Label and a StringProperty binding. If the value of the StringProperty counter changes its value in line 97 the Label is updated automatically. The layout of the GUI is realized with a BorderPane which contains a Pane (headerPane setTop()) and an AnchorPane (anchorPane setBottom()). The Pane for the field is placed in the center (setCenter()). On the left (setLeft()) and right (setRight()) hand side I used a HBoxes as placeholders. The init-Method paints the two boards with the puzzle tiles. For every Rectangle on the left hand side an EventHandler is registered which handles onMouseClicked-events. If the user clicks on a Rectangle the handle method is called and asks the model if there is an empty neighbour field. If there is an empty field the tile is moved and the counter is increased. If both boards are equal the game ends with a success message (youWinText). If you don't like the rectangle tiles, you can replace them with Circle objects with gradients and dropshadow. You can add animations for the moving of the Rectangles so they look more smooth. You can add a stopwatch instead of the counter.